In China, it always pays to book transport the day before. That’s how I missed out on a comfortable two-hour fast rail journey from Chengdu to Chongqing (350kms), and was forced to wait four hours for a slow train which would take another four and a half hours to reach my destination. To make matters worse, there were no seats available, so I paid for standing rights only. It was a cultural experience. 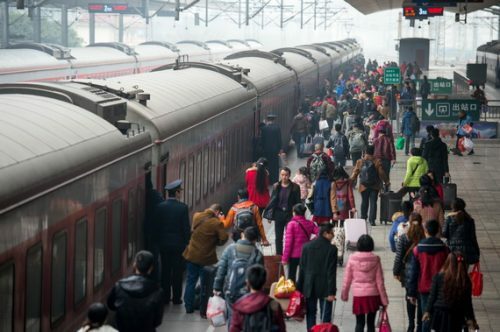 Something good is happening with public transport in China. For example, modern railway stations are the rule now in large cities. Moving masses of people quickly and efficiently is a source of communal pride. And the effort that local governments have put into changing the behaviour of commuters is commendable. People are being asked to queue. The system breaks down however, as soon as you get through the gate to the platform behind the gleaming stainless steel channels guiding the masses past the ticket collectors. Although they know that their seat is reserved for them, some folk remain genetically programmed to struggle for survival. They have to get there first – otherwise they fear that they will miss out. Despite official help for the disabled and the elderly, the spectacle of the able-bodied, the young, and the aggressive bolting out of the gates to the platform in order to secure their seat in a carriage is unedifying. Old habits die hard. Although travelling by slow train is not part of the modern transport regime, it remains the cheapest and quickest way to move millions of poor people around the nation. However, the comforts and courtesies of fast rail travel are unknown in this service. Discomfort is the rule. My slow train to Chongqing reminded me of this reality. When I boarded it, a guard directed me to a small space adjacent to the toilets and between the locked doors at the end of the carriage. I managed to snaffle a corner beside one of the doors which would provide stable support for a dodgy knee and a bad back. A space just large enough for me (standing up), my pack, and my crutches. That’s all. Maybe 50cms square. Eight men squeezed into this tin box at the far end of the carriage. Jostling for territory and lighting up. The air poisoned by the acrid smell of their cheap cigarettes. No open windows. Just a pane of glass in a cold metal door. Claustrophobic. They were a shifty-eyed lot. One Han Chinese youth full of self-confidence and bad manners. Three grim looking middle-aged men, burdened by a hard life – probably migrant workers. Two sour-faced dark-skinned men in dirty white shirts, off-the-rack suits, and green ex-army sandshoes. Speaking a dialect I could not recognise. Probably Yi minority people. This was not the place for a friendly “Ni hao” and a chat. It was a time for no eye contact, and a little ‘don’t even think about it’ body-language. A time for guarding territory and being ready for anything. An aside: Many poor people in China believe that all Westerners are rich. I could almost hear these two Yi minority thugs thinking, “This Westerner is alone, we are at the end of a jam-packed carriage, and nobody would help him because it’s none of their business.” Not wanting to get involved is a self-protective behaviour for many people in China. What to do? Maybe I am being paranoid. No matter. In China, being paranoid is a useful survival technique. Better to prepare for the worst and hope for the best. I spend the first hour leaning on my crutch and bracing my body in the corner. A guy opposite me, the least intimidating of the group, avoiding eye contact. He’s harmless though. Then he goes to the toilet, leaving his bag to demarcate his territory. One of the Yi men immediately occupies this space, ignoring the other passenger’s bag at his feet. When my corner companion returns from the toilet, he meekly finds another space elsewhere. Now I have one Yi man opposite me, and another on my left. Thinking. How to defend myself if they try to mug me? Deciding that it would be better to use my crutch as a blunt spear-thrust to a stomach than as a club to the head. More effective. An attendant with a trolley of fast-food rolls through no-mans-land, interrupting the mood. The Yi fellows order noodles and squat down on the floor to slurp food into their gobs. I take a peek at the main body of the carriage. Family groups spread three to a two-man seat, and five to a three-man seat. Other folk squatting wherever they can. Food and drink on the collapsible tables attached to the side of the carriage. An air of good humour and tolerance. Eyes looking at this Waiguoren (foreigner) from outer-space. 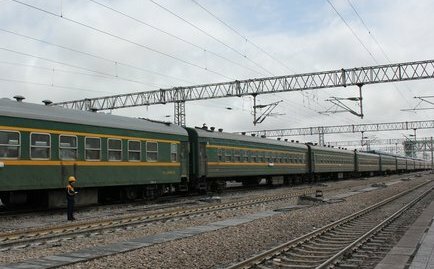 Although this train stops at Chongqing, it will continue on to Guiyang in Guizhou, a poor province where nothing much happens. Modern China is another country to that depressed place, a great source of migrant labour for the booming metropolises elsewhere. Beware of thieves in Guizhou. That’s where these passengers are heading. The countryside rushing by. The two diesel locomotives hauling their load of rural poor across southwest China. When the Yi men finish their meal, they stand up and resume their intimidating posture. Me too. Should have kicked them when they were down eh? Just kidding. It is dark now, time is ticking over and there is one more hour to go. A guard appears, reminding everyone that the next stop is Chongqing. When I thank him in Chinese, the mood in our metal capsule changes. “Wah! Ni hui shuo Zhongwen?” (What! You can speak Chinese?). “Dui. Wo zai er ling ling san nian, laile Chongqing.” (That’s correct. I came to Chongqing in 2003). My two enemies look at each other and relax. Maybe this waiguoren didn’t get off a plane yesterday? Though I will never know if my assessment of these two characters was correct, I am certain that I was right to trust my instincts. My caution being justified by previous experience in the Yi Autonomous Prefecture in the Liangshan area (see: https://ozinchina.com/2012/01/06/butuo/). Protect yourself first. The first law of social behaviour in China – for Chinese people as well as Waiguoren.